Remove the stringy outer pieces of lemongrass and slice the tender lemongrass heart into small rounds. 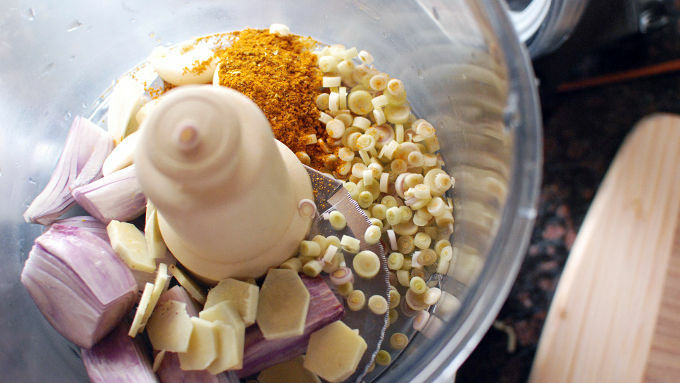 Place all the curry paste ingredients into the food processor and process until smooth. Cut the pineapple, chicken and the red pepper into strips. 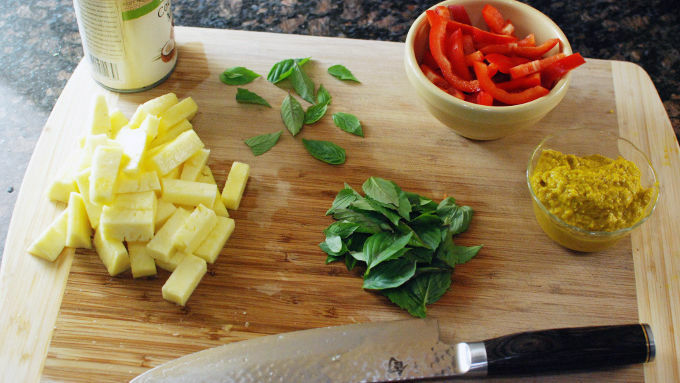 Remove the basil from the stalks and tear the larger leaves. In a hot wok or frying pan, sear the chicken in some oil for about 3 minutes. Add the red pepper and cook another 3 minutes. Add the pineapple and cook about 5 minutes. Add the curry paste and cook for 4 or 5 minutes. Add the coconut milk and bring to a simmer. Lower heat and cook about 7 minutes. Remove from heat, and stir in the basil and lime juice. Yellow curry paste is available in some grocery stores if you want to save time. 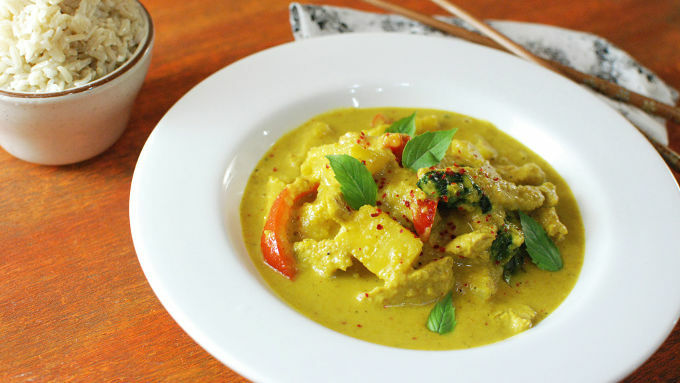 Make an easy Thai dinner tonight with this Spicy Pineapple Chicken Curry dish! Pineapple always makes a fun addition to curry. 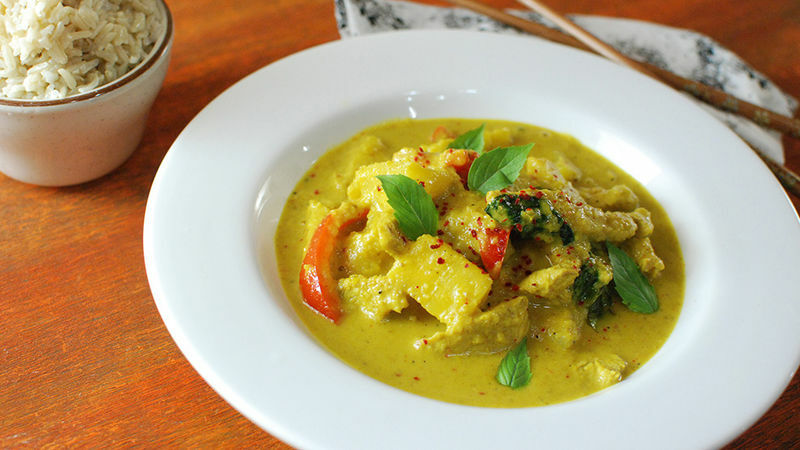 And it pairs so well with basil that it was a no brainer to add it in this yellow curry variation. Cutting the pineapple, red peppers, and chicken in this dish into similarly sized planks really makes this dinner pop visually, but the bright flavors are what makes it pop in your mouth. Fresh Thai basil, lemongrass, and lime juice all give this dish a fresh and unique flavor. If you want to save time, you can use a store-bought curry paste instead of making it from scratch. Either works great though. When making the curry paste, make sure the paste cooks a solid couple minutes so you don't get a raw onion flavor in the final dish. Top off with a few fresh basil leaves and some chile flakes if you want that additional kick. Serve with brown rice. Enjoy!